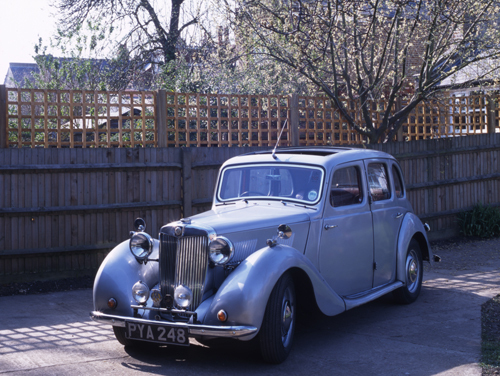 It was in the spring of 1947 that the 11/4 litre MG saloons started to leave the factory gates at Abingdon, better known as the Y series cars, they were often thought of as the MG version of the Morris Eight series E four door saloon. It is true that the MG was based on the Morris 8 which provided the basic body shell pressings, however the power unit was sourced from the Morris 10 series M car. The prototype Y type was originally constructed in 1939 and at this stage the MG was expected to be known as the MG Ten to be launched at the 1940 Motor Show. The car was conceived as a smaller addition to the existing range of MG saloons which were the S. V and W models. It was intended to compete with other similar products on offer from competitors such as Singer, Riley, Triumph and Sunbeam Talbot. The 2nd World war intervened in the development and production of the Y series cars as Abingdon workers turned their skills to more pressing things like building tanks and armoured cars!. Syd Enever and Alec Issigonis had started work on the project codenamed EX 166 as early as 1937 and the development work that had gone into fitting independent suspension onto pre-war MG racing cars was adapted for use on the new Y series cars, in fact the Y saloon was one of the first British production cars to be fitted with such a suspension arrangement and it was considered very advanced for the day. Rack and pinion steering was also introduced for the first time on an MG as it was mechanically more precise that the Bishop Cam type used on the earlier T types. The all-new chassis was of solid and robust construction and was to form the basis for many future sports MGs to come. It consisted of longitudinal box sections between the axles joined by four cross members with the engine and gearbox mounted forward in the chassis to give good weight distribution and allow room for rear seating within the wheelbase. There was a weight penalty however for such a solid chassis with the finished car weighing in at over a ton, this precluded any meaningful performance. With only a single SU carburettor and a detuned version of the 1250 cc XPAG engine as used in the TB that had a lower compression ratio and different valve timing, performance was far from brisk. It was however deemed an ideal cruising car with a high level of comfort coupled with a touch of luxury. The gearbox was a four speed unit with synchromesh on 2nd, 3rd and top, transferring power to the rear wheels via a spiral bevel banjo-type rear axle as fitted to the Morris 10. There were many features fitted as standard to the Y type such as the Smiths Jackall four wheel hydraulic system. Four rams pushed downwards on the ground activated by a hand operated pump unit mounted on the bulkhead. This enabled the driver to raise the whole car off the ground enabling easy wheel changing and other maintenance. The front could be raised independently and vice versa if required. Other features worthy of note were the sliding steel sunroof and top-hinged opening front windscreen which afforded a good variety of ventilation. A telescopically adjustable steering column, adjustable seats and a rear window blind that could be operated by the driver were welcome attributes. The whole car was extremely well appointed by post-war depression standards and was very much in the style of the pre-war S, V and W saloons and tourers. It was welcomed by both the motoring press and public alike when it was announced in the spring of 1947 priced at £671 11s 8d. The car subsequently enjoyed sales success both at home and abroad and although of compact dimensions and not particularly roomy, the ride and roadholding standards were excellent and at the time was judged exceptionally comfortable compared to many of its contemporaries. There were many features fitted as standard on the Y type such as the Smiths 'Jackall' four wheel hydraulic jacking system. This consisted of four hydraulic jacks located adjacent to the wheels that could be lowered all at the same time to support the car entirely free of the ground, this enabled wheel changes and general maintenance. The front could also be raised independently and vice versa. The hydraulic pump was located on the nearside of the engine bulkhead and was activated by a hand operated lever. Other features worthy of note were the opening front screen and sliding steel sunroof together with an adjustable telescopic steering column and rear window blind. The Y Saloon was never designated YA but over the years has adopted the title from owners and enthusiasts. It sold quite well though it could not hope to equal the runaway export success of the TC and TD Midget models. 6,158 examples were produced at Abingdon through until 1951 when a slightly improved version the YB was introduced. This car had slightly smaller wheels (15" instead of 16") and a front anti-roll bar was fitted. Larger heavy duty shock absorbers were employed together with a hypoid rear axle and uprated brakes, all of which greatly improved the car's performance on the road with better handling and stopping power. Like its predecessor, the YB had to counter very little by way of competition from other manufacturers and despite the uninspiring appearance the Y series MG achieved a production figure of well over 8000 units by the end of production in 1953. Worthy of mention is the production of an open touring version of the Y type which was launched at the Motor Show in the autumn of 1948. The YT as it was known was an open topped full four seater. This car was lighter and slightly quicker than the saloon versions powered by a TC specification engine of 1250 cc. The car unfortunately was not greeted with enthusiasm due to its rather bulky appearance and was reminiscent of an Army General's staff car. Most of the production (877) was exported with Australia as the main market. The YT utilised the same chassis as the YA with the 54bhp twin carburettor TC engine as power unit. The dashboard was different being somewhat similar to that of the TC. It was assumed that most of the YTs were built in left hand drive specification for the export markets but in fact most were right hand drive versions destined for Australia rather than the USA. Low volume production of the YT continued through until 1950 and was one of the last open tourers of its kind to be made apart from that produced by the Singer Motor Company. Engine: XPAG 4 cylinder in line, water cooled. Carburation: Single SU 1W semi downdraught. Clutch: 7”' Borg & Beck single dry plate. Suspension: Front: Independent coil and wishbone. Rear; Half elliptic. Shock absorbers: Luvax-Girling piston type. Brakes: Lockheed hydraulic with 9" drums. Track: front 3'11" rear: 4'2"
Steering: Direct acting rack and pinion. Wheels and tyres: Bolt-on ventilated disc. 5.25 x 16"
Production: Early 1947 to late 1953. Performance: 0-60mph in 29.3 secs. Cost new in 1951: £565 plus purchase tax £315 7s 9d.